West Middlesex LTC has plenty of opportunities for competitive tennis. Each year a number of junior teams enter the AEGON Junior Team Tennis in the summer, from 8 and under, up to 18 and under, boys and girls. In the winter these teams play in the Middlesex Winter League. Within the coaching programme there will be matchplay on the 6th and 12th week of the term. Results are sent to the LTA and count towards the players’ ratings. Players are encouraged to join the LTA’s British Tennis Membership where they will be issued with a rating. At the end of each term there is an internal tournament for the players within the programme. West Middlesex LTC hosts South East Club Tour events every other weekend, from 8 & under up to 18 & under, boys and girls events. These are open to players from all over the country. The West Middlesex coaches actively encourage the juniors to participate in external tournaments. To find a tournament visit the LTA website. 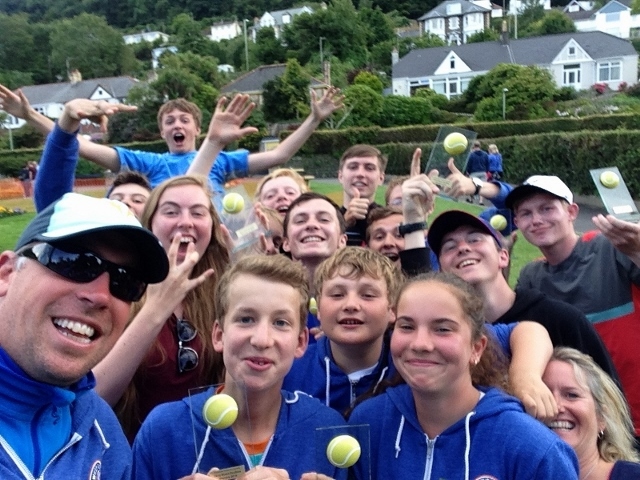 During the last week of July each year, Head Coach Simon Langley takes a party of juniors to Ilfracombe, Devon to take part in a grade 4 tournament at Ilfracombe Tennis Club. In 2015 the team brought home 12 trophies!